Faceted citrine centers sterling petals, creating flowers of a clear lemon color. Linked in a charming bracelet, the blossoms arise from Neeru Goel's design vision. 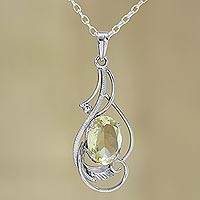 Lemon quartz glows with majestic elegance in this stunning necklace from Alok Jain. 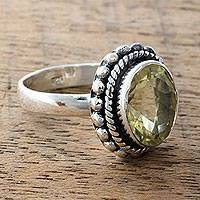 The faceted 20-carat gem is safely encased in sterling silver beams of light. Lemon quartz shimmers beneath sterling silver circles in these alluring dangle earrings from India. 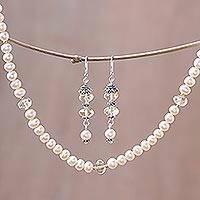 Artisan Aparna designs the earrings, using gemstones that total ten carats.